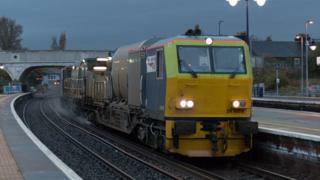 An earlier leaf fall this autumn has had an impact on recent ScotRail performance, the rail operator has said. New figures show that 88.3% of ScotRail trains arrived at stations within five minutes of their scheduled time in the four weeks up to 14 October 2017. This is a fall from recent months which has seen performance at more than 90%. ScotRail said half of this season's leaves had fallen already, compared to just a quarter at this point last year. The leaf fall data was worked out by counting samples of leaves on the ground in Edinburgh, Glasgow, Motherwell and Perth. Leaves on the line mean drivers have to brake and accelerate more slowly than normal, which causes delays and disruption. Specialist treatment trains are used to clean leaf debris off the line and apply a sticky coating to rails to help train wheels' traction. Other factors impacting on performance in recent weeks include four incidents of cable theft or vandalism and a fault with overhead wires. An empty third-party locomotive also passed a red signal by mistake, resulting in all signals on that line turning red and trains being stopped. ScotRail said its rolling performance for the previous 12 months now stood at 91.1% - remaining above the UK-wide figure of 88.4%. David Dickson, ScotRail Alliance's infrastructure director, said the operator had invested £2.6m in dealing with leaves on the line. "While often scoffed at as an 'excuse' for delays, leaves on the line are a big problem for the railway as they make rails dangerously slippy. We're tackling the difficult conditions created by leaf fall every day just now," he said. "This has been a challenging few weeks, but we are doing everything we can to address any problems that arise quickly, to take preventative action wherever possible and make sure that our customers are given good quality information."